Religious liberty was important to those that risked everything to break away from Britain to form the USA. Did they anticipate a secular nation? Christian historian Eddie L. Hyatt is passionate about making known the true story of America’s founding. America was founded on Christian principles and values. It was not founded as a theocracy. Theocratic rulers claim a Divine right to rule over their subjects. America’s founders held no such grandiose view of themselves or any human being, and they had rejected the theocratic claims of popes, priests, and monarchs. They had not, however, rejected Christianity. America’s Founders, for the most part, identified with the mindset of those they called “dissenting Protestants.” The dissenting Protestant insisted that civil government should have no role in the church nor in matters of faith and conscience. Freedom from government tyranny in matters of faith was an ideal that pervaded the thinking of America’s Founders. However, for there to be liberty without license, the Founders knew that the populace would have to be governed from within by virtuous values. That is why they all agreed that only Christianity provided the moral values and intellectual underpinnings for a stable and prosperous nation. 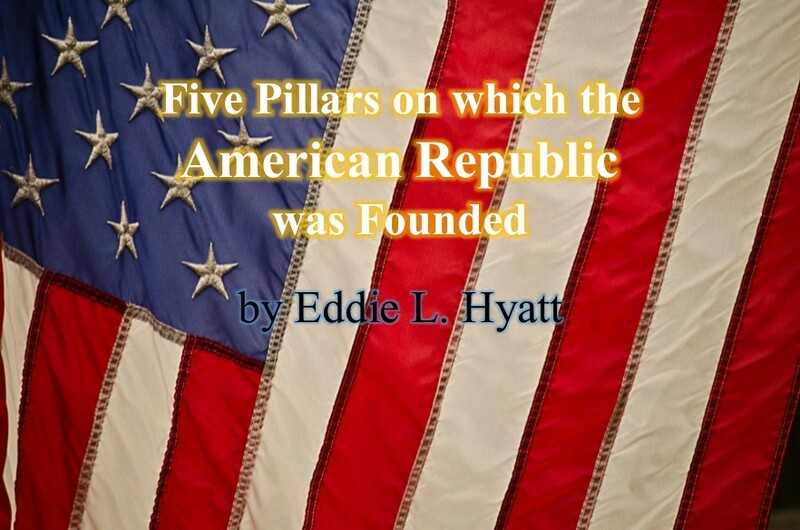 Here are 5 pillars on which the American Republic was founded. Faith in God as the Creator and Moral Governor of the Universe. The Founders considered belief in the God of the Bible as being essential for good citizenship. Unless the citizens would have a moral sense of obligation to their Creator, they would tend to live selfish, unrestrained lives, harmful to society. The belief in a God All Powerful wise and good, is so essential to the moral order of the world and to the happiness of man, that arguments which enforce it cannot be drawn from too many sources nor adapted with too much solicitude to the different characters and capacities impressed with it (Hyatt, Pilgrims and Patriots, 131). The Founders functioned on the assumption of a Divine Creator to whom all creatures owe their love, honor, and respect, and this is made clear by the many proclamations for days of prayer, repentance and thanksgiving issued by the Congress and presidents. During the Revolutionary War no less than 15 such calls for days of prayer were issued by the Continental Congress. After being sworn in as president, George Washington issued a proclamation designating November 26, 1789 as a Day of Thanksgiving. The proclamation assumes the obligation of all citizens to acknowledge God’s existence and to show honor to Him. It opened with the following statement. Whereas it is the duty of all Nations to acknowledge the providence of Almighty God, to obey his will, to be grateful for his benefits, and humbly to implore his protection and favor, and whereas both Houses of Congress have by their joint Committee requested me to recommend to the People of the United States a day of public thanksgiving and prayer to be observed by acknowledging with grateful hearts the many signal favors of Almighty God …. Indeed, although there was tolerance for those of various faiths, there was a hostility toward atheism in early America. This was born out when a judge in the court of Chester County in the state of New York, threw out the testimony of a witness when the witness admitted he did not believe in the existence of God.